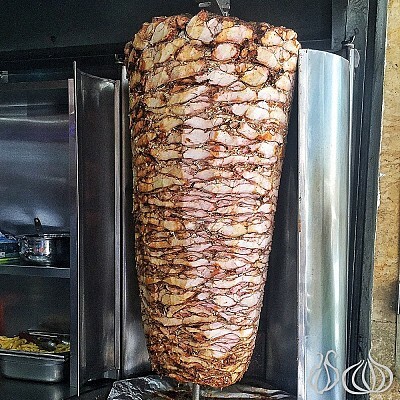 In the heart of Jounieh's Old Souk a restaurant with an eye-catching sign has newly opened. The name is Doughlicious and and truly represents the dough they use - it's excellent. Under a stone arcade, enchanted with soothing tunes, this freshly lit space welcomes you for a selection of pasta, pizza, starters and sandwiches. I loved it here, and the first impression was great. 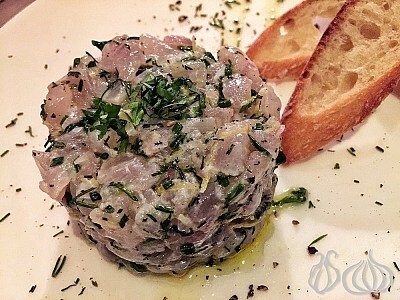 The place enjoys enough light to take marvelous photos of the food. Metallic chandeliers are suspended from the stone ceiling, there's a long bar clad in sheets of black metal and funky tables imprinted with cartoon drawings of pizza are dotted around. The menu is displayed over an open kitchen facing the entrance. For dinner, I ordered two starters, a salad, pasta, two pizzas and a savory waffle. Canadian Poutine with gravy and a cheese mix: crinkle-cut fries topped with a thick gravy and cheese curd. The fries are crisp and end up being soft after a couple minutes, richly bathing in an amazing gravy and some soft white cheese chunks. Even though it would have been better if they used normal fries, this is an enjoyable starter. Tuna pasta salad with mixed lettuce, fusilli pasta, fresh mushrooms, corn, cherry tomatoes and tuna all together creating a fresh and green offering. 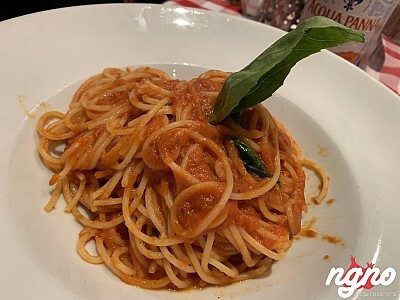 A generous portion in which I loved the quality of the pasta and how well it was cooked, the balance of ingredients and the sauce, which, combined with the lemon mayo on the side together gave the right texture and high notes of flavor to the salad. Tasty! The pizza cone: a very thin and crunchy cone loaded with melted cheese and tomato sauce. It's not like any conventional pizza you have had and it's not like the pizza cone I had on the streets in Seoul. It's a version that's classier and tastier for sure. Prepare to dig in and dirty your hands. Fettuccini Alfredo with shrimp, fresh mushrooms, Alfredo sauce and Parmesan. 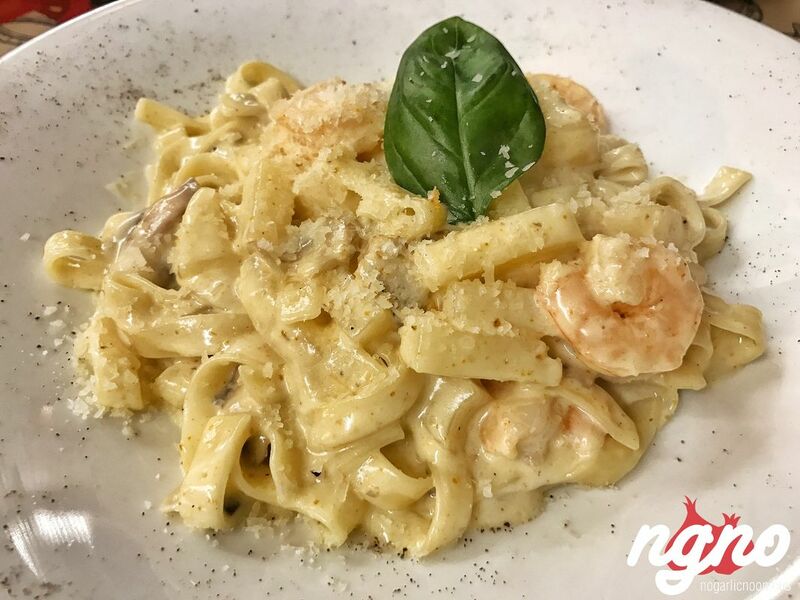 Nicely done - American style - fettuccini with a generous quantity of shrimps cooked to perfection and thinly sliced fresh mushrooms. Enjoyably creamy pasta with pineapple cubes and some real flavor. A pasta suitable for children and adults alike. 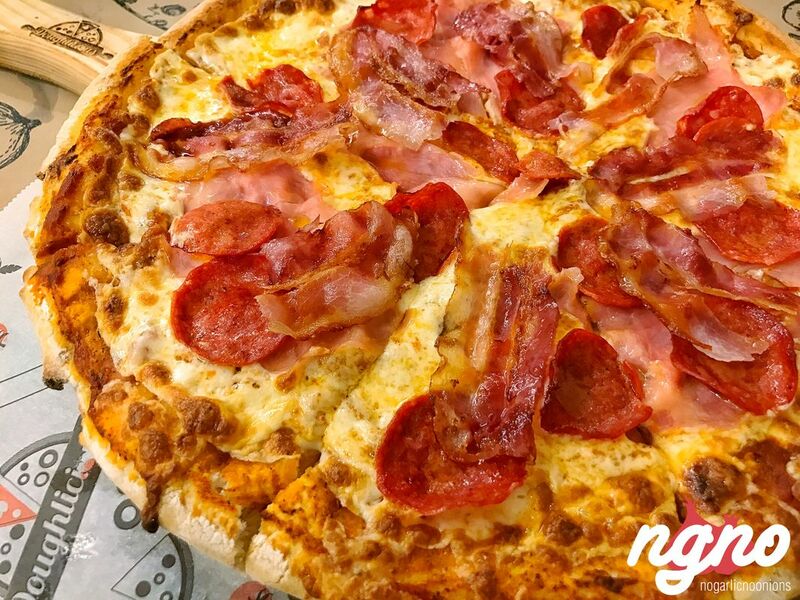 Meat lovers' pizza: when I read 'meat lovers' I imagined the synthetic meat pizza sold at Pizza Hut but I was wrong - never judge too quickly! It consists of bacon, ham, pepperoni and mozzarella cheese. I loved the dough - the look of it, its fresh feel, its thin crust and melting cheese that doesn't taste or feel cheap. Bravo for such a good creation. The dough at Doughlicious is butter-free and milk-free and this makes all the difference. 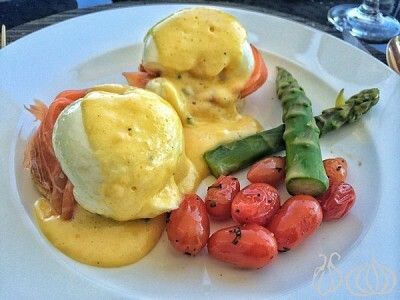 The Doughlicious salmon pizza is a signature dish. Guacamole sauce, a load of salmon, cream cheese, capers, dill, lemon slices and white mozzarella cheese. The dough is different to the normal American pizza, it is thick and crisp with a crunchy feel and the ingredients added cold on top of it. 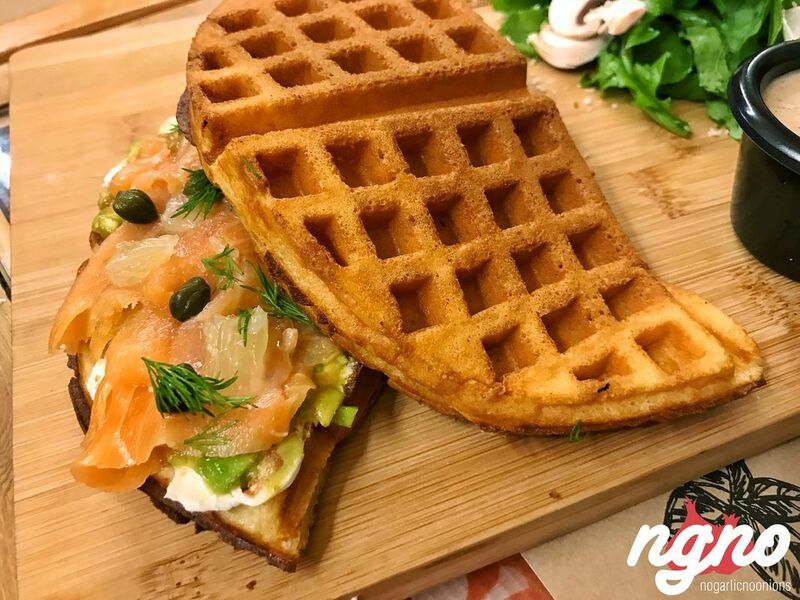 A waffle sandwich, one on top and one on the bottom, stuffed with these fine ingredients: cold salmon; cream cheese; capers; lemon slices; guacamole sauce; dill and smoked salmon. Savory all the way, no sweetness, but it lacked the crunch I expected. Doughlicious is the story of Fady who has lived all his life in Canada handling several famous food chains. Back in Lebanon, he has created a little baby inspired by years of know how. 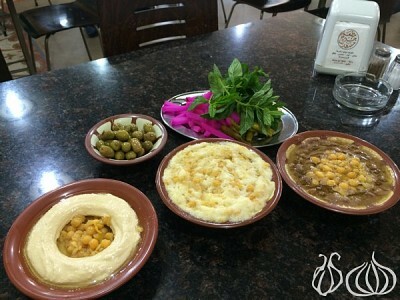 You feel the passion in every plate, well decorated, generously filled and carefully prepared. Chocolate mousse, the kind of mousse I love and gives a familiar feeling of my childhood. Soft and smooth, light and not sweet. Crown your experience with this. 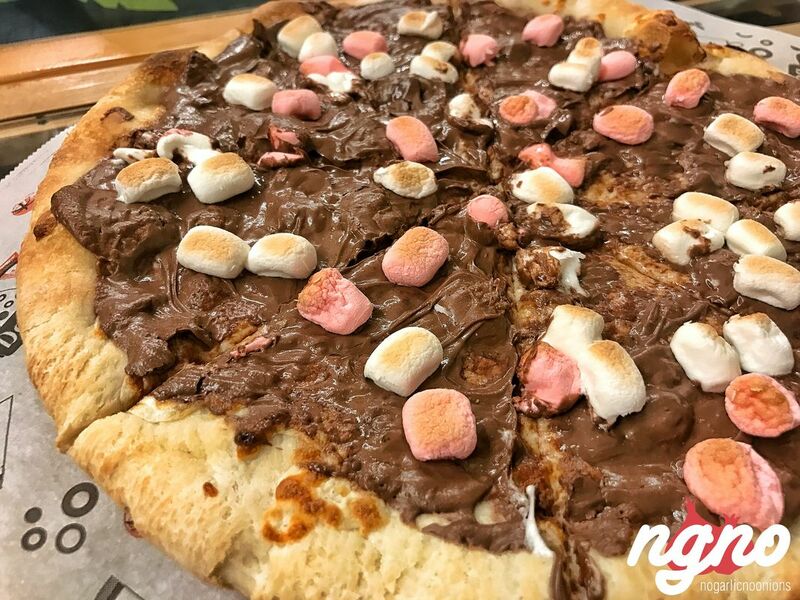 An amazing mouthwatering Nutella pizza topped with marshmallows. I loved the dough and this is what matters... Nutella adds value and sweetness. Loved it and will remember it for some time. I enjoyed it here - the mood, the vibes, the lighting and decor followed by a pleasant dinner experience I'll surely repeat soon. Lebanon has a new diner and it's called Doughlicious, give this place a try and support a young and passionate entrepreneur. 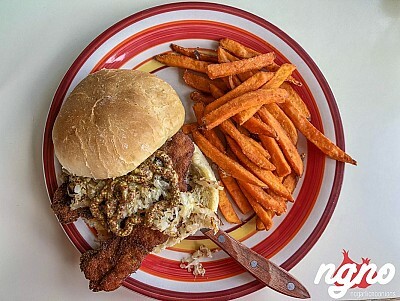 Burgelicious: The World's First Burger Spread!